Thank you, Deade, Mountaindude28 and Magenta! I never pondered the 3 days and nights before - I always just knew it was true and accepted it. Now, my intellectual brain has caught up with my spiritual understanding. LOL! Much love and appreciation to all of you for enlightening me! No problemo. I am super glad that all of us helped on that. There is a lot to learn and that's why I hope those who feel called to understand G-d's word deeper, that they take it very seriously. But others can be simple to and really show the light of Yeshua amongst all forms of life! Here's a question then. I want to see if we can go 2 for 2. If the Passover/Pesach Seder/Meal can ONLY be eating on the NIGHT of Passover/Pesach, and Yeshua died before the night of Pesach (High Shabbat/Sabbath/Sabbaton), then what meal was Yeshua eating with his disciples? (Hint: The Greek word for "bread" is NOT translated to Matzah). Explain how you fit 3 days and 3 nights into Friday sundown to Sunday morning? But you can fit 3 nights and 3 days from Wednesday sundown to Saturday sundown. The Biblical day founded by God is not the same as our days.. The Biblical day starts at sundown and ends at the following sundown.. So the true Passover starts at Sundown and Jesus had His Passover meal at the correct time.. Jesus had his Passover meal on the night of Passover and then was executed on the day of Passover..
5 "And God called the light Day, and the darkness he called Night. And the evening and the morning were the first day." 13 And having gone, they found it as He had said to them, and they prepared the Passover. 19 And having taken the bread, having given thanks, He broke it and gave to them, saying, “This is My body, which is given for you; do this in remembrance of Me,” 20 and the cup likewise, after having supped, saying, “This cup is the new covenant in My blood, which is being poured out for you. ^ If Nisan 10 [per Ex12:3-6] was indeed when Jesus rode into Jerusalem on the colt (what we call Palm Sunday), then the 14th (at even) would have fallen on Thursday. Jesus was born 34 BC, that would make 30 AD the year He was crucified. Nisan 14 falls on a Wednesday as shown in the Hebrew calendar below. Adstar is calling the First Day of Unleavened Bread Passover like the Jews call the whole week. Passover is actually synonymous with the preparation day. The actual Feast is called the First Day of Unleavened Bread. I am sorry Adstar, you called the right day for Passover. I just reread it. When you do get time to research it, realize that to put crucifixion on 32 AD Jesus would have to been born 2 BC. 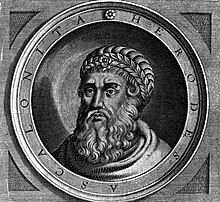 That is not possible as Herod the Great died on 4 BC. He was the one that ordered the massacre of the innocents at Bethlehem (Matt 2). LOL! Mountaindude28, you go ahead and be as serious as you want, but for me - the more I go deeper in God's Word the more JOYFUL I become!!! Isn't the JOY of the Lord our strength? What is the name the prophet that said, ".........the joy of the Lord is your strength?" Lol! That’s why I said those who are called to it. Did not the Pharisee Paul who knew tons studying under Gamliel not study ANOTHER 3 years after he met Yeshua? But of course this what Paul was called too! Sure he had joy but one can have joy and study and suffer at the same time! That’s what I love about Paul or Yeshua! Sure we take joy but there is tons of work to do! But everyone in the body of Mashiach does have their own role and I love those who are simple and joyful and keep it simple, as much as one who studies to know truth, because THE TRUTH SHALL SET YOU FREEEEEEEE!!!! What scripture is this? You have 4 different scriptures quoted above and then you put scripture below it without stipulating what book and chapter those verses come from???????? I offer this web site which shows what i believe to be an accurate account of the week of the execution of Jesus..
Well 32 Ad isn't going to work as it is too far to the weekly Sabbath falling on a Monday. See below. "Warning! Results for year 1752 C.E. and earlier may be inaccurate. Hebcal does not take into account a correction of ten days that was introduced by Pope Gregory XIII known as the Gregorian Reformation"
So, I was saying that Nisan 10 [per Ex12:3-6 (the selection and following examination of the lamb)] was on Palm Sunday... making Nisan 14 to be Thursday of that week.